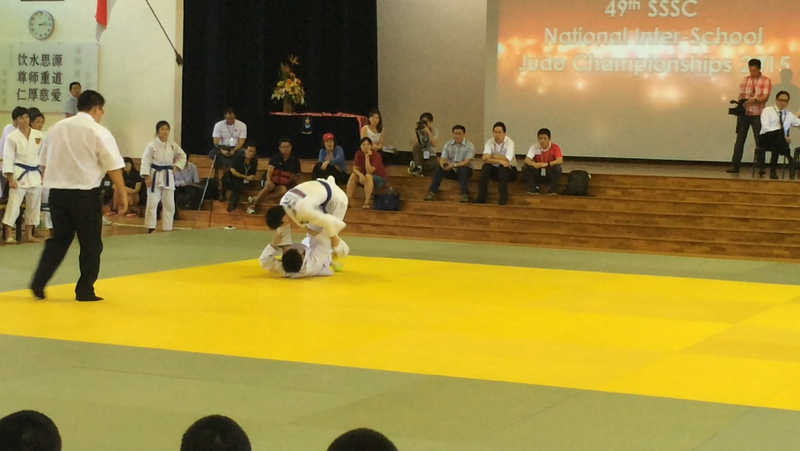 After bringing home a double championship just a few weeks ago, the Judo team returned to Hougang Secondary School again for the National Inter-School Individual Judo Championships. 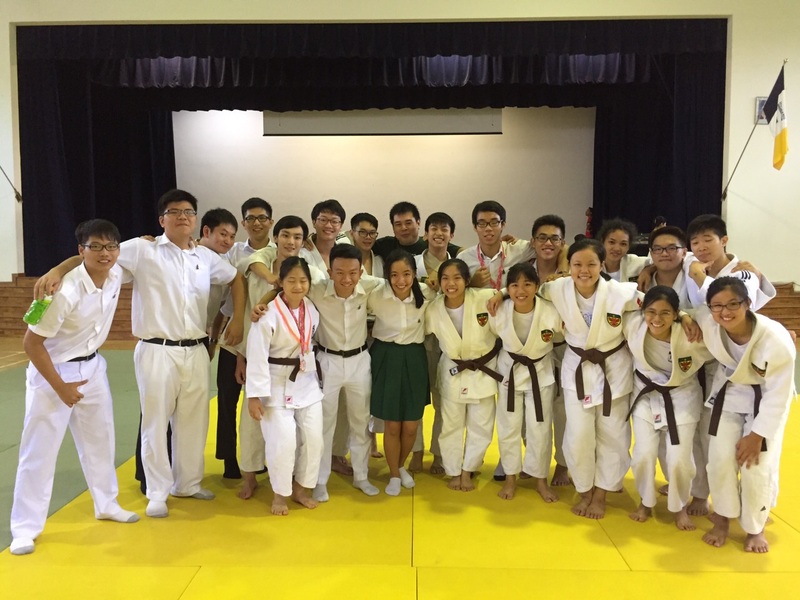 This year witnessed the participation of Raffles Institution in all the matches (or more commonly referred to as “bouts”) for the ‘A’ Division Finals, save for the matches in the Girls’ Extra Lightweight and the Boys’ Heavyweight categories. The atmosphere in the indoor sports hall while waiting for the bouts was slightly relaxed, but the tension was visible on most of the judokas’ faces as they warmed up and practised. Boys’ captain Yong Kang Ren (15S03E), although not participating, was there to support his juniors and batchmates. He agreed that after bringing home the double team championships, there was definitely palpable pressure meeting expectations, but they were also “quite confident in their individual events”, and was certain that both the boys and girls would perform well. ippon, a “perfect” throw, earning a full point. If a throw is unable to be executed, pinning down one’s opponent also earns points; 10-15 seconds for yuko, 16-20 seconds for waza-ari, and over 20 seconds for ippon. Penalties, called shido, may be given for excessively rough play, and can be used to determine the outcome of the match if no full points are scored. Charis began with some difficulty in grappling her opponent, but eventually managed to score a waza-ari partway through. This was followed by another waza-ari in quick succession, earning Charis a full point, and subsequently victory. Gareth, despite being in the midst of recovering from an injured foot, scored waza-ari, followed by yuko. Though his opponent became more cautious, and managed to avoid being thrown over in several attempts, Gareth eventually managed to throw the opponent down, scoring an ippon and winning the bout. In a redux of the team finals’ bout, Jia Xiang faced the same opponent for the gold. The match was tight; in spite of his determination and perserverance, Jia Xiang still lost to the opponent, Kam Wei Lee Wesley (of Nanyang Junior College) by a single yuko, which was scored halfway through. In Fadhillah’s bout, her opponent attempted to match her movements, giving her stiff competition for a good while, while countering her throws. 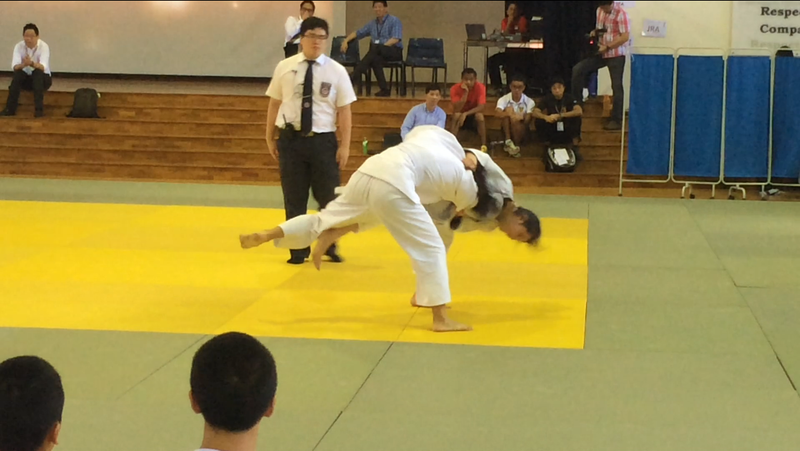 However, Fadhillah did not falter, and finally managed to score an ippon with a pin-down. Bo Dong was a force to be reckoned with in his bout against his formidable opponent – while it was clear he was skilled, managing to score waza-ari early in, his opponent Chua Jun Kai (of NYJC) managed to overcome him and win with an ippon scored towards the end of the bout. Although giving her opponent room to go on the offensive in the first part, Tania later became relentless, attempting to throw her opponent at every last chance possible, and sparing no room to counter. She eventually won with a pin-down, scoring ippon. For the Boys’ Category, both judokas were from RI, and so the victory was clinched for certain – but Yuan Bo and Thomas faced each other in an impressive clash, with Yuan Bo emerging as the champion. Another gold was clinched; but beyond that, what was important was the fighting spirit that both girls displayed. In the bout between teammates respectively, both displayed great prowess in the sport, but Joey triumphed over Joyce eventually with waza-ari scored towards the end. To summarise, our judokas had obtained 6 golds (2 for the boys, and 4 for the girls) out of 10, an achievement made possible by impressive efforts all around. 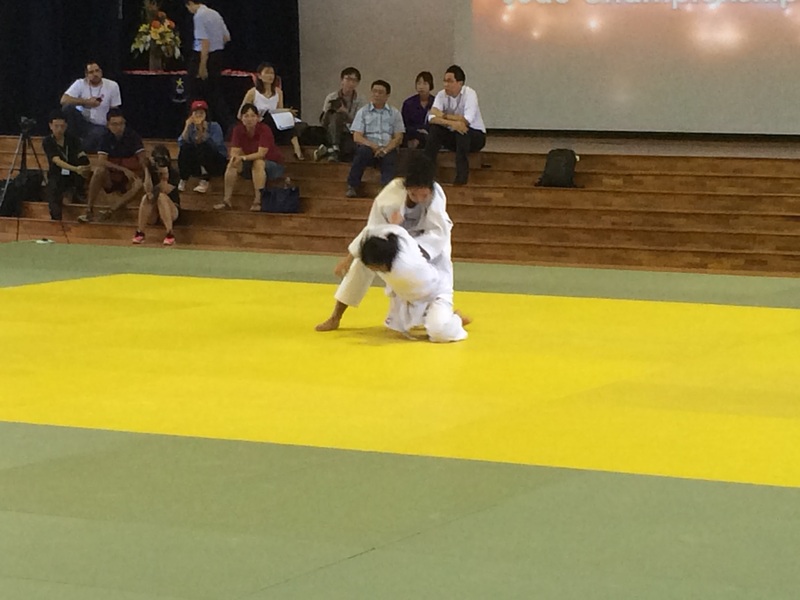 The coach, Mr. Tan Yi, said that the judokas were “up to expectations”, and was “very happy” with their progress. Kudos to the judokas for their tenacity and hard work and having attained such high standards!